In 1780 the good folk living along London’s Old Broad Street were abuzz with the news that a new wine merchant was opening on their doorstep. 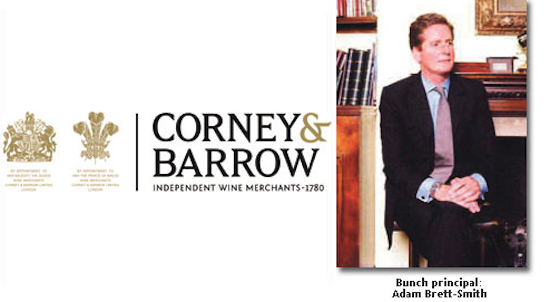 Edward Bland Corney’s shop sold only a limited range of port, sherry and Bordeaux, but it flourished and evolved into Corney & Barrow, one of the great names on the London wine scene. The old store is now consigned to the history books, but in 2018 the firm boasts thriving sales to private clients and a range of on-trade accounts, with a turnover of £60 million and offices in London, Newmarket, North Yorkshire, Edinburgh, Ayr, Hong Kong and Singapore. Sixty per-cent of sales nowadays come through private customers, while 30% is to the on-trade. The remainder goes to the off-trade and corporate clients. When asked who his main competitors are, Brett-Smith says: “Berry Bros & Rudd is a great competitor. Justerini & Brooks, The Wine Society, Farr Vintners – they are all great. We stand out on the service we offer and our wine. That is the crux of the firm’s business model: exclusively retailing a streamlined selection of wines of supreme quality to the end consumer. “We do not have a strategy for supplying the trade in future,” says Brett-Smith. “We classify the on-trade as an honorary end consumer and that part of the business has been good for us. “The private customer business is the one that has been fantastically successful. Private customers are the heart of the business. That’s something we are pursuing quite aggressively. In its last financial reports, for the year to April 30, 2017, the group saw turnover decrease £3.3 million to £60.3 million, but profit rose 100% to £2.6 million. That was sparked by the sale of Corney & Barrow Bars, a group of 11 wine bars, to Drake & Morgan. That marked the end of 57 years in the wine bar business and the strategy going forward is to ramp up sales to private customers and the on-trade. “What profits we make, and this is unique in a company of our size, are divided into three, evenly distributed between shareholders, staff and reserves, which is reinvested into the company to ensure better service,” says Brett-Smith. Meanwhile, the denizens of Newmarket – a town of just 20,000 people – are truly blessed when it comes to local amenities. Not only does the town have the home of horseracing, with nine Group 1 races a year, including the 1,000 Guineas Stakes, but it also has a thriving Corney & Barrow store, offering some of the finest Burgundy on the market, and it is set for a revamp. “It’s like a pocket-sized Berry Bros,” says Brett-Smith, adding: “We are just about to invest in a Newmarket operation that has been trundling along very nicely, without any dynamism. The entire East Anglia region has changed immeasurably in the past 15 years. A lot of money has moved in. You only have to look at the property prices to see that there are an awful lot of younger people moving into that area. When asked about the challenges the business faces as it bids to maintain its record of not missing dividends, he calls exchange rates “a bore, not a challenge”, because everyone is in the same boat. “Over the past four years, the biggest challenge has been sourcing,” he says. “That is not down to the ability of our buyers to source the right quality, but just sourcing the right quantity. “In Burgundy there hasn’t been a generous vintage since 2009. Last year will address that, thank god, but it has been too long to wait. That’s a big challenge. Expect to hear more, then, from this 238-year-old wine merchant in the months ahead as it continues to espouse the virtues of being an inch wide and five inches deep.